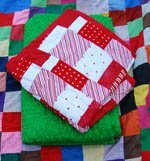 This easy baby quilt pattern uses the strip quilting method for creating a "crazy quilt" of random patchwork. A great beginners quilt and a perfect stash buster! It is also very quick to make. This is the quilt that many non-quilters can easily start with and still get amazing looking results, the fabric does all the work for you! Just pick out coordinating fabrics and your quilt is sure to look put together, even though it is randomly assembled. You'll get the best results if you stick to one type of fabric. While quilting cotton is ideal, I've seen amazing strip quilts made from cordoruy and denim too! The trick is to stick with fabrics that are all the same thickness or weight. Don't mix a heavyweight fabric next to a lightweight one or you can get weird puckering. Pick out coordinating cotton fabrics for your quilt and then cut into strips. Your strips can be the same width or different, it is completely up to you! Using the same width will create more of a square patchwork while using different widths will give more of a random pattern. Next, sew together your strips until you reach the length of the quilt you want. I generally do a couple sets of strips so I can have a few variations in the order. Then cut across your strips (creating strips of strips) as shown in the second image with the ruler. Now assemble your patchwork strips in an order that looks good to you and then sew them together. Next, you'll create what is called the "quilt sandwich" which is the patchwork quilt top, the interior quilt batting (I use a bamboo/cotton blend) and the cotton backing material of your quilt. Pin together. Finally you will make your quilt...a quilt! You can either hand quilt or machine quilt, it is up to you. For quicker results, obviously machine quilting has its benefits and it what I chose to make this tutorial. You can machine quilt randomly or create patterns with your machine. Once it is fully quilted, you can finish the quilt by adding on the binding. You can purchase quilt binding as shown or you can make your own out of fabric or fabric ribbon. If you want to try making your own binding, here is Heather Bailey's Quilt Binding tutorial for continuous quilt binding and here is Anna Maria Horner's satin ribbon binding explaination. In green above, is an example of handquilting, which is beautiful by itself on the plain backing fabric. 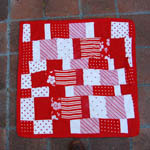 The other quilt uses square strips, all cut the same size to create a square patchwork pattern. This is a great way to make a quilt from random fabric scraps! Unfortunately, I don't have photo tutorials for these older quilts of mine, they were finished long before this website existed! However, I show them here since they were made using the same strip quilting method and you can see how different the results can be based on your fabric choices and size of the strips. Go to the Make Baby Bedding & Blankets Section for more baby bedding patterns and tutorials! Back to the top of the Easy Baby Quilt Pattern page.